As a single mom to two young boys, Frances already had her hands full. Her oldest son, 9-year-old Diego, has a very rare medical condition that requires special medication to be brought to the island. When Hurricane Maria struck Puerto Rico, Frances no longer had access to the medication Diego needed. She went to the local news station, pleading for help to get the medicine delivered. Every day that passed, she watched him grow weaker and she became more frantic. When she heard Humvees making their way through town, Frances threw herself in front of the vehicles in desperation. Dr. Antonia Novello, a Central Floridian who had flown to the island to help, realized the gravity of the situation and arranged for transport of the family to the Nemours Children’s Hospital in Orlando, Florida. As the months passed, Diego regained his strength and fully recovered. Frances found a job, and applied for the Hurricane Maria Housing Assistance Program for help with the initial deposits in order to secure an apartment for her family. Although they only had a couple of twin mattress and a pack of paper plates, it was a place to call home. 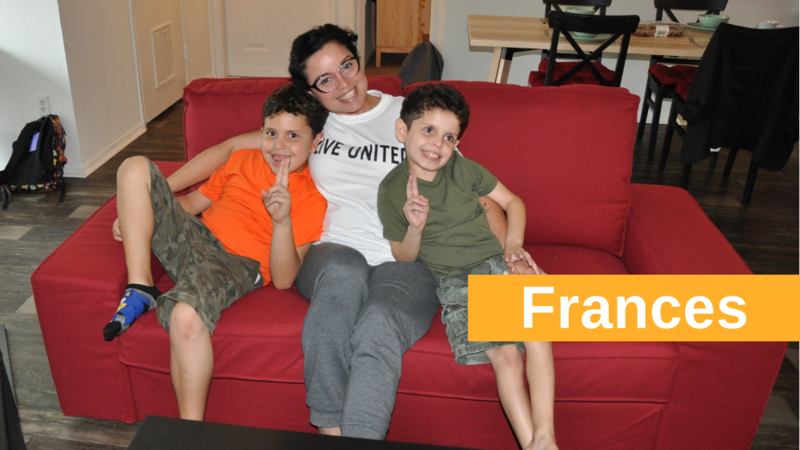 With the expansion of the Hurricane Maria Housing Assistance Program, however, Frances was able to go to Ikea to pick out beds for her sons, a couch to do homework on and a dining room table they could have dinner at together. Now their apartment is home sweet home.